"Oral SteriClean UV Toothbrush Sanitizers are not used just to keep our mouth healthy, there are used to keep our entire body, heart, lungs, and other vital organs healthy! Most of the bacteria on our toothbrush cause heart disease, stroke, infectious endocarditis, meningitis, respiratory infections, pneumonia, blood infections, ear infections, eye infections, life threatening diseases, ulcers, GI Tract infections, gum disease, cavities, and much more! 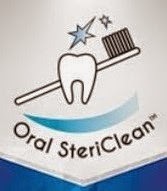 Oral SteriClean is the only sanitizer that has proven clinical data and truly works! Place your toothbrush in the sanitizer, it automatically turns on and off. It's that simple! ( Your toothbrush harbors as many as 100 million bacteria, this bacteria affects all the organs of the body. -England's University of Manchester, 2012 ) ( 70 % toothbrushes are heavily contaminated with microorganisms affecting our heart and making us sick -New York State Dental Journal , 2012 )." I was sent the blue portable UV toothbrush sanitizer from Oral Stericlean to review. This sanitizer costs $19.95. Shipping is free with Amazon Prime. This toothbrush sanitizer arrived in great condition. There were no dents, defects, nor issues during shipment. The box measures 9.75" x 2.5" x 1.25" at its widest points. The box is made nicely, and flips open from the top. The front of the box labels the product and brand. It provides features of this sanitizer and examples of the bacteria that it eliminates. The back of the box provides statistics related to the use of this sanitizer. The right side of the box provides the manufacturer's information, labels the (1) year warranty, and that this is made in China. The left side lists infections and diseases that this toothbrush sanitizer can help eliminate. You are also going to need (2) AA batteries that are not included. The box opens up from the top. When you pull out the actual sanitizer, you will find that it is wrapped in protective bubble wrap. There is a nice, detailed instruction manual included. The battery compartment is located on the underside. It opens with a hinge on the backside. It's easy to open and close. There is a clip closure, and it stays put. The UV light is about the size of a standard toothbrush head. My husband is the one who has really gotten me into teeth-cleaning products. I've always liked them, but I never really paid attention to how many there actually are. I was amazed at what this can do. It's helpful for your toothbrush, and beneficial to you. All you have to do is clip your toothbrush inside, and close the top. The light comes on instantly and shuts off on its own. It's that simple! Eliminates up to 99.9% of bacteria, viruses, molds, and yeasts. Easy to transport (great for travel!). I haven't found any cons of this UV Sanitizer. Ever since I've been using this, I don't want to remember a time where I hadn't. It's amazing. Every time I use my toothbrush, I feel like I'm actually cleaning my teeth rather than spreading germs around my mouth. It's a great holder, and I love all of its features. I highly recommend this. 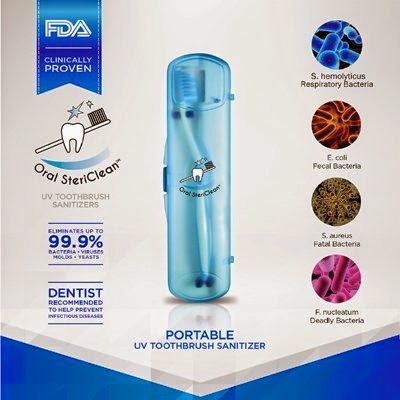 Are you wanting to try the Oral Stericlean UV Portable Toothbrush Sanitizer, too? Click the link below, and order away!